The EEA is dedicated to providing education on the principles, framework, and implementation processes to help organizations achieve strategic and tactical objectives, in sales, marketing, human resources, operations, and community relationships. 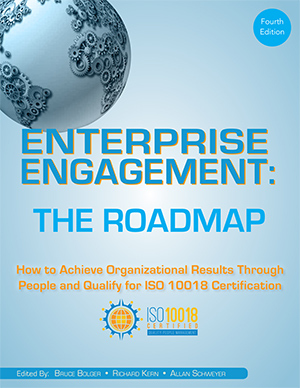 The book has been completely updated with new information, illustrations and new chapters and includes complete information on ISO 10018 quality people management standards and certification and the audit methodology. Authored and edited by dozens of experts in general management, marketing, sales, data management, business and academia, the Textbook’s methodology has been endorsed by leading companies as a means of achieving both strategic and tactical organizational goals related to sales, marketing, human resources, vendor management, and community relations. If you need information immediately, you can also access individual chapters in a PDF format by clicking here. A free online education program with live and recorded webinars and courses that include preparation for the Enterprise Engagement certification program. The Enterprise Engagement Alliance founders and curriculum contributors are available to provide public speaking, training and facilitation on all aspects of engagement across the enterprise. With extensive practical, speaking, and training expertise in all areas of engagement, the speaking and training team is headed by Enterprise Engagement Alliance co-founders Bruce Bolger and Allan Schweyer. We generally customize each presentation to the specific needs of clients on a broad area of topics related to people and engagement in business. An annual education program designed to train professionals in the information needed to obtain an Advanced Engagement Practitioner and ISO 10018 certification. A program enabling people to demonstrate their understanding of the framework, implementation process, and tools of Enterprise Engagement. An online test enabling people to demonstrate their understanding of the essential elements of enterprise engagement. The Enterprise Engagement Alliance has provided a comprehensive syllabus for a one hour, one day, one week, and a full semester course on Enterprise Engagement. Click here for more information.